Straughan Photography shot the wedding of Sebryna and Cody on Saturday, April 17th, 2010. 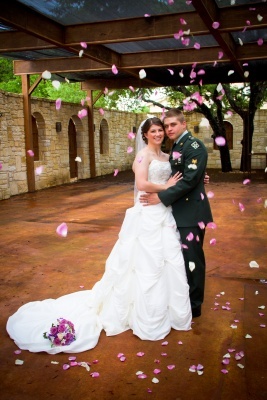 Their wedding and reception took place in the quaint Faithville Village, which is tucked in the Hill Country. The Amazing Grace Chapel proved to be a delightful setting for their afternoon wedding.In thechapel thestain glassed windows, rustic architecture, chandeliers and the rose petal lined aisle added a particular charm to the day. The entire day was filled with splashes of lilac and royal violet, from the dresses to the table settings at the reception. Immediately following the ceremony everyone convened at the The Gathering Place, also located in the Faithville Village, where guests dined and danced ‘til dusk. The rain did nothing to slow down this event! Congratulations to Sebryna and Cody, and good luckspending yournew life together in Colorado!